Why go to the effort to donate? This website exists because of access to public collections such as those at the State Library of Victoria (and the many local and regional libraries), and the generosity of many of the AFL clubs. As users of these collections, we would like to take this opportunity to suggest that if you have a collection of old photos or club materials gathering dust in a cupboard - there is great value in donating them. Local history societies and private museums place value upon, and actively collect, historical items and memorabilia. Football club historians, in particular, are keen to gain access to more historical material. They produce displays, and provide photos for publications and research. Some clubs have publicly accessible museums. However, the clubs generally do not have photos of every player that ever played with the club, especially if that person only played a few games, or played over fifty years ago. The clubs will appreciate every new photo or piece of memorabilia donated. 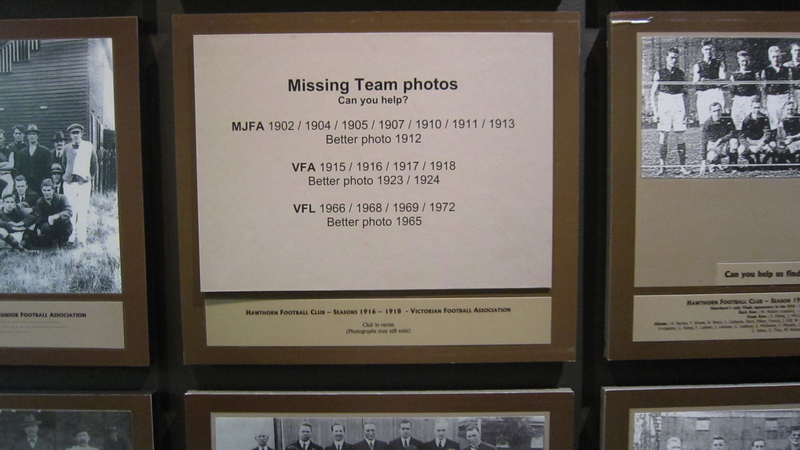 Don't assume the club has a copy of an old photo. Why not email them a digital copy? Photos and videos of - players, spectators, grounds, club events etc. Memorabilia/collectables - for example posters, badges, scrapbooks. Players' items - trophies, medallions, jumpers, tour mementos etc. Modern scanners and cameras have high resolutions, and a high quality image is always preferred. If using a scanner, scan at 600dpi and in colour. Even if you are scanning an old black and white image, the colour scan provides a higher quality scan. If using a camera, try to donate the original camera image rather than an image that has been cropped or resized. Do not be afraid to take multiple copies of the front and back of an image. You can even place a ruler beside your image so that there is an understanding of scale. If the photo is in a frame, try to take an image of the photo in the frame, as well as a photo of the photo. Many organisations, for example local history societies and private museums, will accept donations. 'Where to donate' will depend on 'why you donate'. Ask yourself - is it important that the public have access to what I am donating? Perhaps, on the other hand, you are donating to support the collection of the club. Or for some other reason. As a user of various collections, you will discover a marked difference between institutions when it comes to their views on public access. Some organisations (such as the State Library of Victoria) have the money and drive to digitize much of their material for easy access. In other places you will need permission to access the collection, and may even have to pay to take a photo. If you are considering donating an original item, it may be useful to find out how publicly accessible the item will be, and if (and how) future users will know who donated the item. We have found the football community to be very generous. We have also been highly impressed by the State Library of Victoria. Every museum will be picky. They may already have acquired some of the material you offer, or particular items could be outside the range of material they aim to collect. The State Library is a wonderful and supportive institution. Its collection is well used, and there are many temporary displays of materials. An item donated to the SLV collection will most likely be used.